Etched Buck Glass by Perry Coyle. Shipped with USPS Priority Mail. Perry Coyle Etched Platter Hummingbird Flowers Mireau Studio Art Glass 14 1/2"
Mireau Studio Art Glass. Mireau Studio Art Glass 14 1/2". Made and signed by artist Perry Coyle. Etched Platter Hummingbird and Flowers. Very beautiful condition. Platter is in great condition. Take a close look at the photos. Perry Coyle ELEGANT CRYSTAL ETCHED VASE "BEAR" Signed 8"
For sale is an excellent condition etched unicorn glass by Perry Coyle. See pictures for more details. I will always combine where I can regardless of item size. Recent Winston Salem, NC estate find. These Perry Coyle signed crystal footed vases are in pristine condition. Truly beautiful pieces and a perfect matching pair. Price listed is for both pieces. O ri en ta l Fa n La dy E tc he d Gl as s Va se - A R ar e Cl as si c.
L@@K! PERRY COYLE SIGNED GLASS VASE HUMMINGBIRDS IRISES FLORAL 11" STUNNING! PERRY COYLE SIGNED GLASS VASE. HUMMINGBIRDS AND IRISES. FLORAL DESIGN. 11" TALL BY 4" WIDE. New ListingPerry Coyle Vase, Fox Hunt Scene, Equestrian. Excellent!! Rare!! 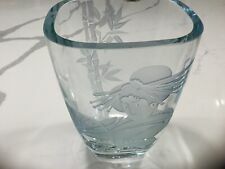 THIS GORGEOUS CRYSTAL VASE WAS ETCHED AND SIGNED BY ARTIST PERRY COYLE...THE PERIMETER OF THE VASE HAS AN INTAGLIO ETCHED HUNT SCENE OF HORSES AND DOGS ON ONE SIDE AND HAS FOX AND PINE TREES ON THE OTHER, ...HAS ARTISTS' SIGNATURE ON THE SIDE....WOULD MAKE A FANTASTIC GIFT FOR THE EQUESTRIAN. VERY RARE ELEGANT SHAPE. IN GREAT CONDITION. DISPLAYS BEAUTIFULLY ON IT'S OWN.MEASURES 10" TALL. Coyle was a Steuben artist and carves beautiful likenesses in fine crystal. Each is 6 5/8" in height with the air bubble in the base. They are heavy and elegant and these belong in any fine collection. Perry Coyle Platter Etched RARE Plate Mireau Studio Glass Crystal 15” diam. 2/20/91 Signed Artist Proof #1 - One of a kind -Four Detailed Zebra’s interacting and Tree., 8 3/4 " Tall x 6 1/4" Widest “ Zebras”. few faint scratches. Stunning set of 2 matching Perry Coyle etched crystal wine glasses ~ Goblets. Pine Cone design. Mireau Crystal Co. Signed Perry Coyle Etched Glasses. Double old fashioned size glass with open bubble detail on the bottom. If you are interested in only certain glasses, I am willing to break up the set. Very rare and beautiful glasses from a stunning collection. Perry Coyle ELEGANT CRYSTAL ETCHED VASE "AFRICAN IBEX" Signed 8"
Elegant Perry Coyle Mireau Studios Large Serving (Punch) Bowl. Signed Coyle. Whimsical Etched Unicorn Design. Crafted of Fine Quality Art Glass. Fine Art, Collectibles, Jewelry. Mireau Crystal Co. and Oasis Studio Glass was founded by glass artist Perry Coyle. Based in L.A. from 1961 to 1981, he moved the factory to Lake Arrowhead CA for the next 15 years and in 1996, to Colorado. Gorgeous rare Perry Coyle 12 3/4” etched glass plate / platter featuring an Iris flower. This is from Mireau studios and is in excellent pre-owned condition! THIS BOWL IS IN EXCELLENT CONDITION WITH NO SIGNS OF WEAR. IT IS 8" TALL AND ABOUT 9 3/4" ACROSS THE TOP DON'T MISS OUT! Perry Coyle Art Glass Etched 3 Eagles Vase, Signed, 8" Tall x 6 1/2" Widest, 4.8 Lbs Weight . This is a Perry Coyle Art Glass Etched 3 Eagles Vase, Signed, 8" Tall x 6 1/2" Widest, 4.8 Lbs Weight. Very nice Perry Coyle cased glass bud vase. It is etch signed Coyle on the side of the base. For more information on the artist see picture #7. I have provided a lot of pictures to best describe this vase. PERRY COYLE. 10-7/8" ETCHED UNICORN VASE. CAN HOLD 2-3 DOZEN FLOWERS. Rare Piece. This piece features a long tailed hummingbird and irises. Simply beautiful, this deeply sand etched and frosted vase is a show stopper. Beautifully and deeply etched crystal vase featuring a nicely shadowed swallowtail hummingbird and grape leafs and flowers.